How much would a relationship with America’s International Travel Expert® benefit your business or organization? If you would like to discuss the possibility of my writing a review, an endorsement, blog posts, publishing photos & videos, providing social media exposure, etc., for your hotel/resort, please submit the form on the CONTACT page. I look forward to working with you! Stuart Gustafson personally took each photograph displayed, and the copyrighted images are owned by him. If you click on a thumbnail image, you will see a larger and more complete picture that opens in a separate window. The extensive write-up for Ventus at Marina El Cid Spa & Beach Resort has been moved to my FEATURED Experiences page. We’ve been owners in the WorldMark system for fifteen years. We really love the convenience of being able to book online, to book any number of days, any time we want. The resorts are also very nice, well maintained, and well stocked for those wanting to do their own cooking. We went up to McCall out of Boise for a short 2-night stay just to have a little break. The front desk staff was excellent, and Deborah was especially helpful. We’re looking forward to our next venture up there in two weeks. 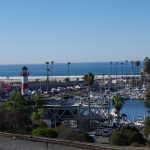 The Lake View Hotel — formerly known as the Lake View House — is conveniently located a block from the water and so close to the main area that walking there every day is easy to do. It’s actually older than the Grand Hotel, having continuously being a hotel since the mid 1800s. 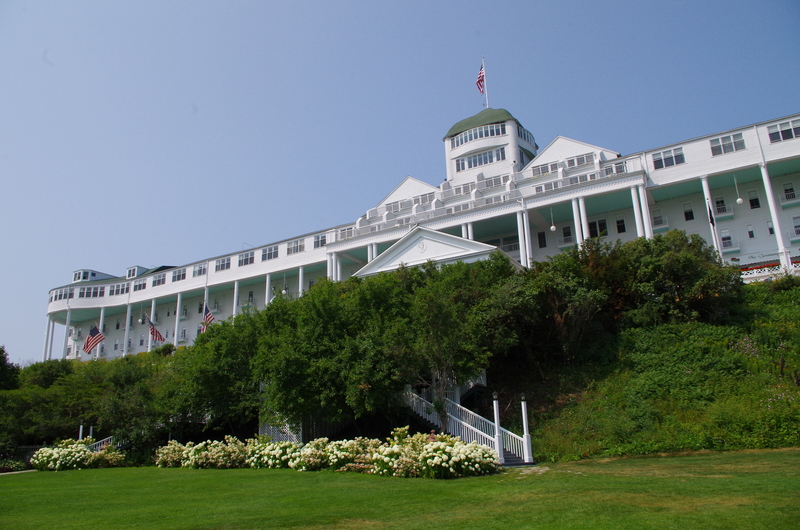 There are many nice places to stay on Mackinac Island — this clearly is one of the top places to consider! 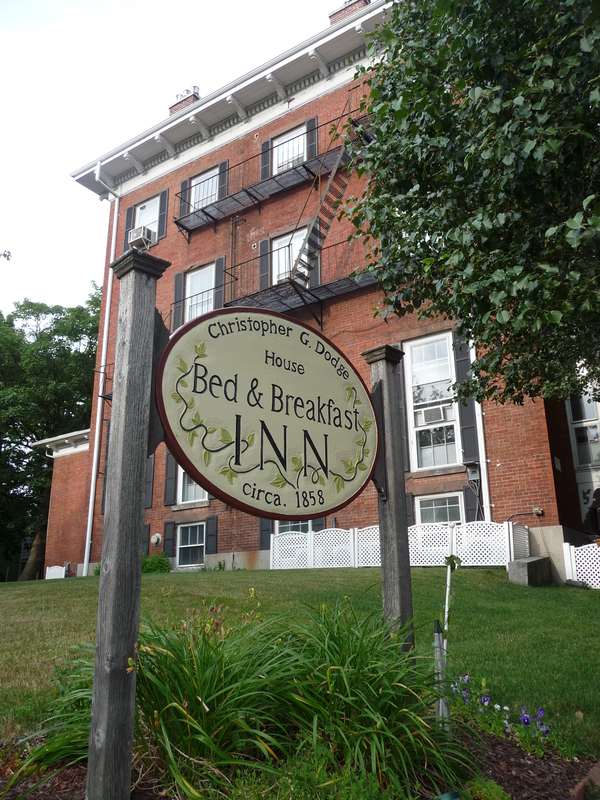 We stayed at the Christopher Dodge House B&B for two nights before we boarded a cruise. Our room on the ground floor was spacious, well appointed and super clean. The breakfasts were amazing with fresh fruit, cereals, and a hot dish. Coffee and tea are available all day, and the staff are super friendly. 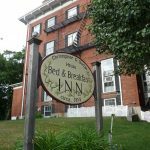 The location is very nice as it’s in a quiet area, yet close enough for walking to the State house, to downtown shops, to the area around Brown College, etc. This is THE place to stay in Providence! We needed to stay in Chicago for just one night as we were between trips. The Hotel Chicago was a great place for us to stay — right near the river, and there are tons of places to eat nearby. With my gold Marriott Rewards status, we were able to check in early AND check out late — saving us from having to store luggage. 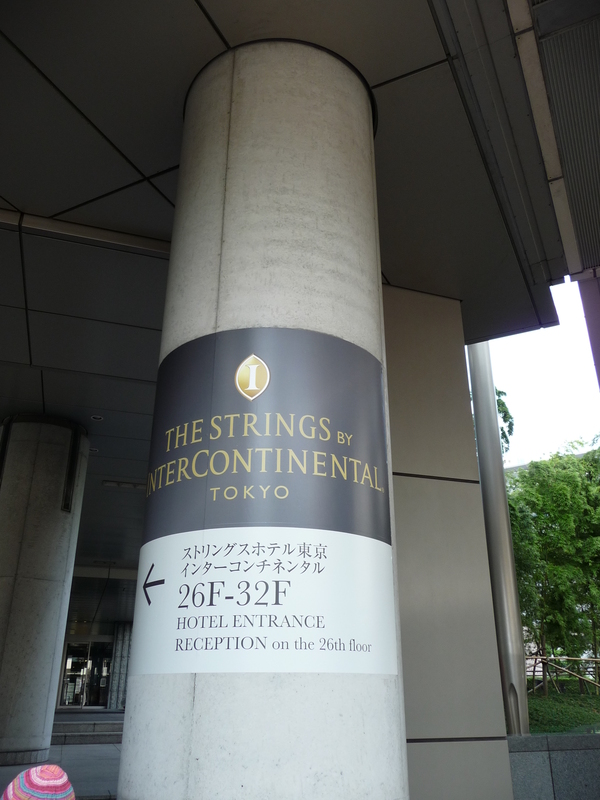 The concierge was very helpful in showing us how to get to the train station while pointing out the best route to go. I would gladly stay here at Hotel Chicago the next time we’re in town. Our cruise ship tour included a stop (and lunch) at the magnificent Grand Hotel. Claiming the world’s longest front porch, the hotel is known for its opulent rooms, magnificent views, and lovely grounds. If you’re not a guest at the the hotel, there is a $10 charge just to go into it. The flowers are pretty, and there are paths leading through the gardens. The Anchor Inn in Little Current on Manitoulin Island in Lake Huron sits right in the heart of this quaint town. Right across from a small park, its corner setting is ideal for rooms with great views. To me, the best part is the outdoor deck where one can enjoy the crisp air and a cold beer while watching people go by. I flew into Pearson Airport (code YYZ) in Toronto to board a cruise, and I needed a hotel room for one night. This hotel is near the airport, has a 24-hour shuttle, and has been very nice. 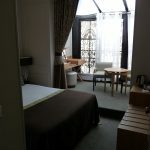 The large suite allows me to do some work (such as write this review), watch the U.S. Open Golf Tournament on the large T.V., and it has a full kitchen in case I were staying longer. I enjoyed the hearty complimentary breakfast this morning, and the staff have all been very friendly and helpful. It’s a shame I can’t stay for longer, but I’m also excited to be joining an amazing cruise. Room Tip: they’re all good — I prefer a higher room. 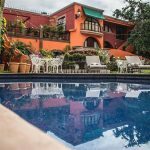 I brought our group of six to stay at Casa Bella on our tour this year. 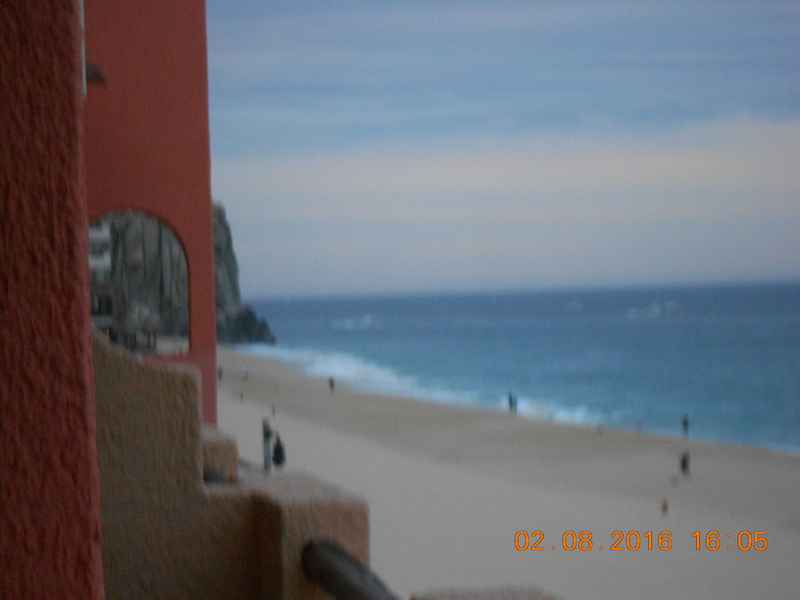 Just like when we were here last year, the hotel was a great place to stay as it’s hidden in plain sight right in the heart of Cabo San Lucas. Barbara and her staff once again made us all feel like welcomed guests into her home; the grounds were immaculate; the fruit and breads for breakfast were perfect and tasty, and the spacious rooms were clean and comfortable. 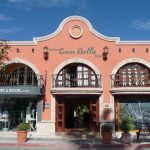 Casa Bella is right on Hidalgo, the road that should be called “Restaurant Row” as there are so many delightful places to eat. You could stay there for weeks and eat at a different place each night! 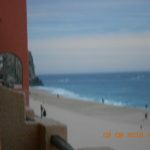 I’m already making plans to take two tours to Cabo San Lucas next year, and I hope Barbara will have rooms for us (p.s. I love endorsing this hotel, but I hope it doesn’t get so busy that I can’t get a reservation when I need one). Room Tip: Each one is unique, from twin beds to suites. 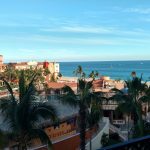 See my [rather long] blog post on the 2017 Los Cabos Tour where we stayed at Casa Bella Boutique Hotel. 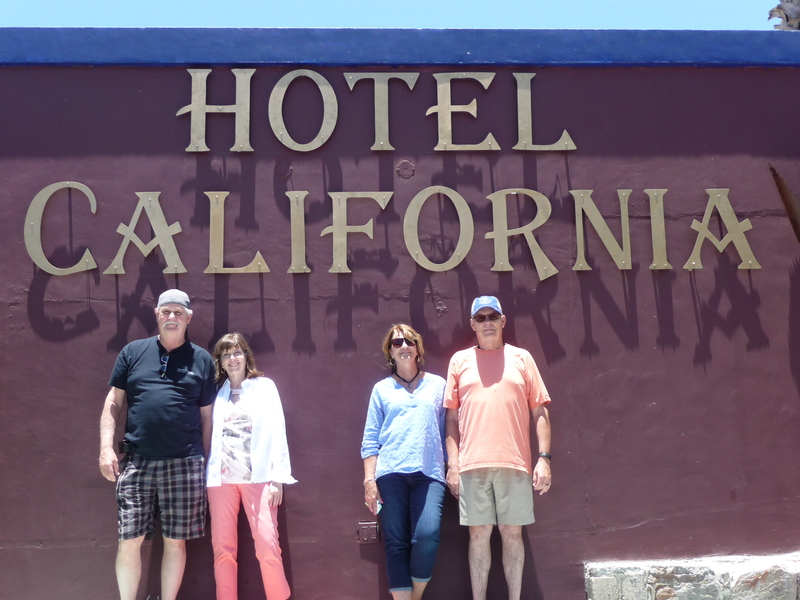 I bring our small-group tours to Todos Santos each year, and the first place we go is to Hotel California for nachos and a margarita. The margaritas are quite tasty and the baked nachos are HUGE! We ordered two plates for the six of us, and we still had some left over. The rock and roll music was good even though we never heard a song by the Eagles, but it’s still a fun place to go. The neighboring emporium is spendy and not very friendly! We had a small-group private tour of 3 couples for 3 days and 2 nights on Beijing. When the hotel was listed as Holiday Inn, we were a little concerned, but any concerns were quickly erased when we arrived at the hotel. The service was excellent; the rooms were spacious, light, immaculate; and the complimentary breakfast was absolutely delightful. There is a machine in the lobby that converts currency into local currency (there is a small charge per transaction, so you might want to pool your money to save a little on the transaction charge). There’s not much in the local area, although we did go to a restaurant that was recommended by our local guide — it was great. But that’s for another review. I would definitely stay here again on a return visit to Beijing. 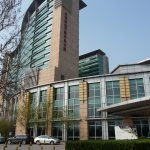 The Marriott Executive Apartments in TEDA (Tianjin’s Economic Development Area) are the perfect place to stay when you are in Tianjin for an extended time. The typical Marriott amenities are available to you, and there are many pubs and restaurants within a block or two of the property — you can in either direction when you walk out and you’ll find the eateries very close by. 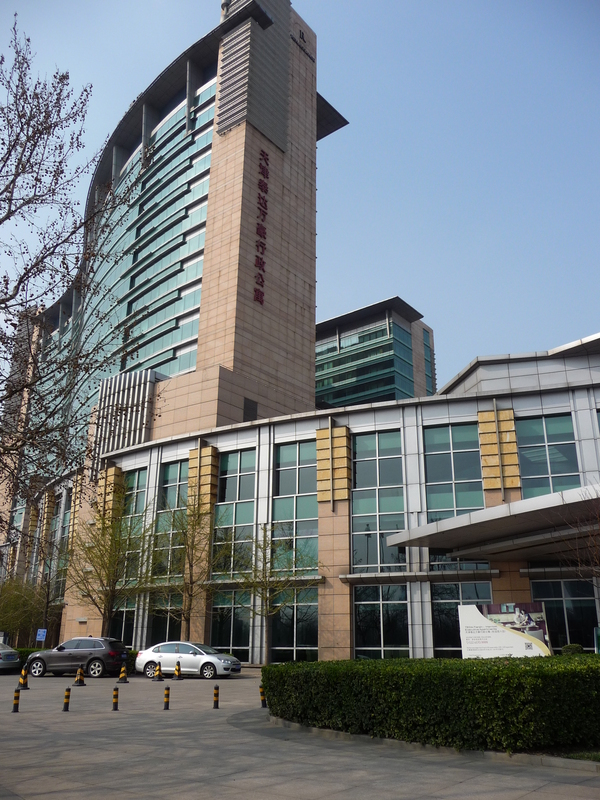 The Renaissance Convention Centre Hotel in TEDA — Tianjin Economic (and Technology) Development Area — is in a great location. 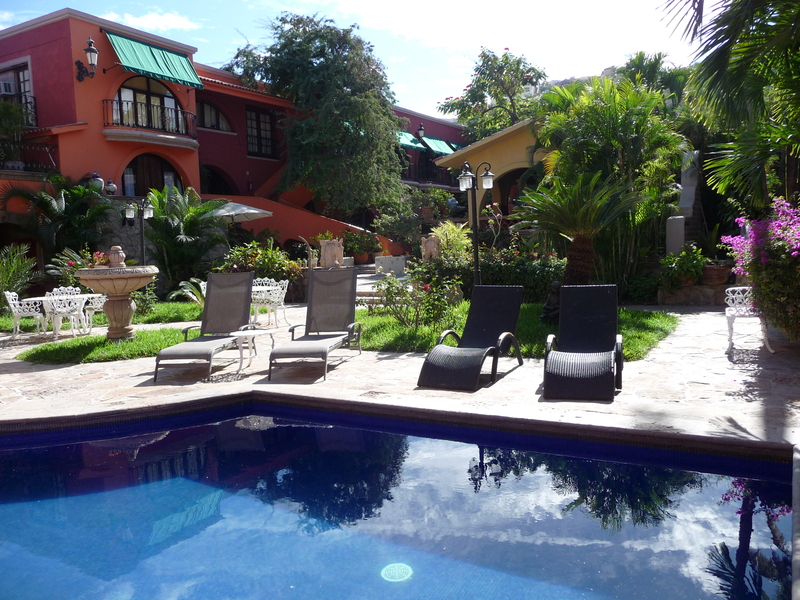 The property itself is of top quality as you would expect from the Marriott chain. You can find pubs and restaurants nearby on both sides whether you exit right or left from the centre. This hotel seems be a popular place for cruise ship tour groups to stop for lunch. They are very organized with table markings, and they even have a sign on each table with WiFi username and password instructions. The food was very good with a selection of Thai, Japanese, Chinese, and Indian dishes. Each person also received a bottle of water plus a soft drink. This is the sister hotel to where we stayed for a couple days before getting on a ship. We went here for the complimentary daily breakfast that had a decent selection of hot and cold items, plus coffee, juices, breads, etc. Unlike many U.S. hotels, the breakfast room was not crowded, and it was very pleasant. As we were getting ready to leave, one of the service staff suggested that we go to the roof top (“press ‘R’ in the elevator,” she told us) — you’ll like the views. We went up there and we did get a nice view of the city. It’s not very high, so some of the tall buildings blocked some of the view. But we did see the Singapore Flyer, two towers of the Marina Bay Sands Hotel, and some of the River. I’m glad we went up there! We needed a hotel room for a couple days before getting on a cruise ship. I booked this online through a service, and it’s been a nice stay. We’re right next to the metro system and just a couple blocks away from Chinatown. The rooms are cozy but clean and the free breakfast is nice. WiFi is included; it’s been up most of the time. Unless you want to spend big bucks (aka, you’re on an expense account), this is a nice hotel with very nice staff — I’d stay here again! We were owners of one of the small beach units before they were replaced about six years ago with the new high-rise resort buildings. We loved our old small studio on the beach, and reluctantly I will say that the replacement is exceptional. The staff is super friendly, starting with Emmanuel (Manny), the Bell Captain who guides a professional team of people to greet you and handle all your luggage and travel desires. We’re in building 6 and we enjoy having the glass door open at night so we can hear the waves rolling to shore. The maid service is great, with the one exception of not knowing when she’s going to arrive — one day it’s 10 AM and then it’s 4 PM the next day. That is something that could be fixed. Four of us (one had never been there) stopped in the Hotel California Bar today just for a soft drink. It was a busy time as there were cruise ship tours in town; we were asked to go out back, which was fine. Service was very pleasant even though they might have wanted the table for someone ordering food and margaritas. The Cokes and iced tea were nicely chilled and we never felt rushed. We’ve owned at Playa Grande for 14 years, and it’s a shame that management doesn’t understand that their guests don’t want noisy carts rolling along the uneven pathways at all hours of the night and morning. They could replace the wheels with soft rubber wheels that don’t make the noise, but that might cost money (sarcasm). Fix the wheels or don’t have the carts moving around between 9 PM and 8 AM. p.s. I did have a reply from General Manager Ramon who said they are purchasing pneumatic tires for the carts and also adjusting their set-up and take-down times for the theme evenings. So I’ll see how it is when we’re there in 2018. Driving to the WorldMark in McCall is easy for us in Boise. We’ve been here (we consider it our “home timeshare”) about 8 times, and we always enjoy it. This time it was for two 2BR units for a total of 8 people. 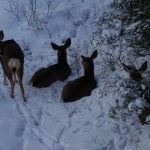 Everything was great, of course, and we really enjoyed watching the snow come down, sledding in the parking lot, and seeing the deer. 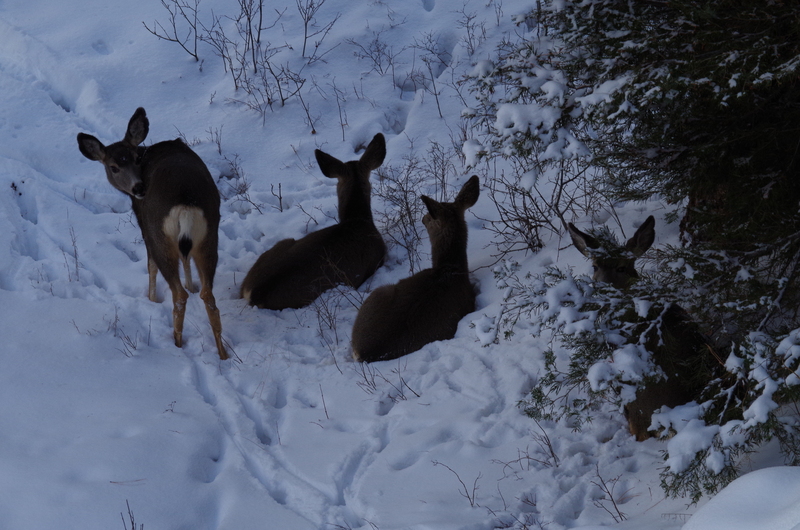 There was a family of four (deer) that was taking it easy right outside our patio — just sitting in the snow. They finally got up, stretched, and started to nibble on the pine tree needles; what a great sight. The staff was super friendly and helpful, and we’ve never been pressured (or even asked) to take an “Owner’s Update” at this resort — that’s nice!! This was just a one-night stop on our way back from Southern California as we broke up the long drive home. I’m not sure if we would have found the place with a regular map as it is quite isolated, and the one main road to turn on doesn’t have a street sign so you’d know where to turn. Thank goodness for GPS. Our one-bedroom unit was top floor at an end of the building; we looked out to open area and a beautiful sky. The suite had all the normal WorldMark amenities (one of the great things we love about the WorldMark system), and it was very quiet. We’d driven 440 miles that day, and so I wanted to relax in the jetted bathtub — the problem is that the “hot” water became cold water after the water was about six inches in the tub (I don’t like cold baths). I got in anyway and turned on the jets. Bad choice. Two of the jets were above the water line so water was going all over the room. Turned off the jets and gave up on taking a bath. We left the next morning at 8:30 to continue our drive home. 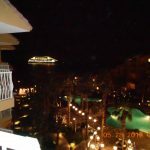 As owners in the WorldMark timeshare system, we’ve stayed at this property before. We were here again (from Idaho) for a wedding and we used A LOT of points for 7 nights in a 3-Bedromm Penthouse unit. 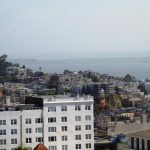 The suite was excellent: 3 bedrooms, 3 baths with jetted tubs, an extraordinary kitchen with supplies for eight, a double length top-floor end-unit balcony with great views of the Pacific Ocean. Sounds good, so why the rating? On our second day, I spotted an insect crawling across the Master Bedroom carpet — it looked like a termite. I got rid of it, but when I went to adjust the window blinds, I saw a couple hundred of the termites on the window sill. I sprayed them with a non-toxic essential oils mixture of Cedarwood and water. That stopped the ones (that I saw anyway). I called the front desk and a maintenance man was sent up with his gallon of [quite toxic] Spectracide spray. He sprayed just the sill and didn’t look to see if there were any others in another room or even somewhere in that room (There were, on the insides of the drapes). Down to the front desk I went to talk with Justin, Guest Services Manager. The best solution that was offered that I would accept was to “downgrade” to a 2-BR unit one floor below for two days while they cleaned our place. We had to pack back up, move downstairs for two days. On Saturday, we moved backed to our original unit, but had to do it in a hurry as the wedding rehearsal started at noon. The suite looked clean but I vacuumed the entire place anyway. An “Incident Report” was taken, and I was told that it would take about a month (really?!) for Owner Care to contact me about a certificate good for future stay at any property in the system — we’ll wait and see how that works out. p.s. I was contacted by Owner Care, and I received two certificates good for a total of five nights in the WorldMark system. I wasn’t actually offloaded; it’s just a term used by the airlines when a passenger gives up his/her seat. That’s what I did yesterday when my flight from Narita to Denver was in an oversold situation. The gave me a voucher to this hotel, and the room I’m in is just fine. Two beds and a nice bath and shower combination. The view out the window is of mostly trees making it a nice serene look. The meal vouchers aren’t terribly generous (1,500 Yen each for dinner and for breakfast), but I can make do with them. Wi-fi in the room is free and easy to connect. 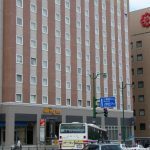 This high-end hotel is conveniently located right next to the JR Shinegawa Station, and it’s only a short walk (or taxi ride) from the famous Ginza shopping strict. All the rooms have a nice view as the hotel occupies floors 26 through 32. 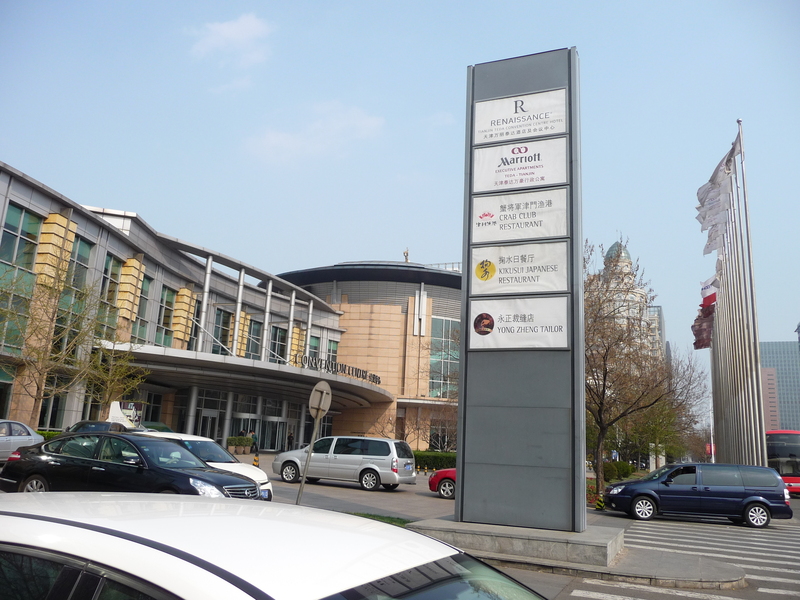 There are nearby parks, other shopping districts, and business centers. 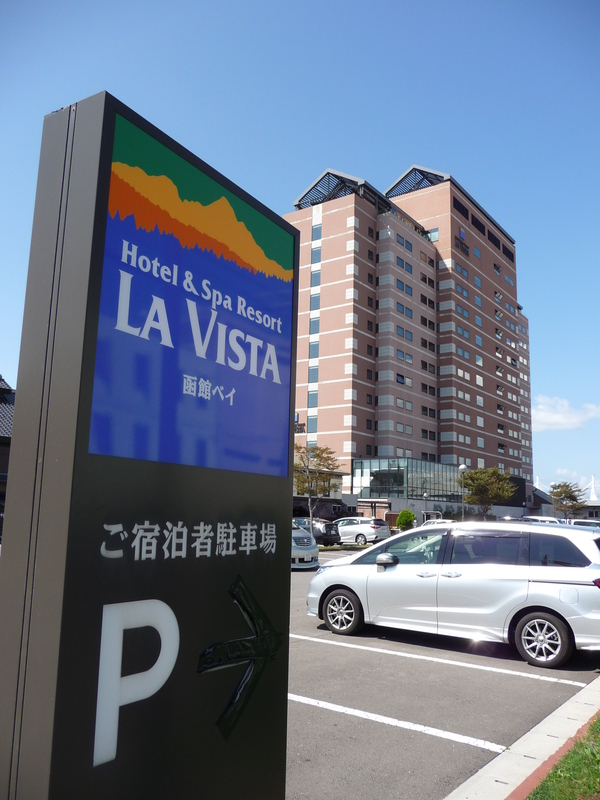 You can’t get any closer to the Hakodate Bay than staying at La Vista. 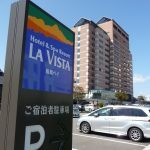 This high-rise hotel is modern, clean, and within walking distance of most tourist sites (think Morning Market) and especially the JR Train Station. 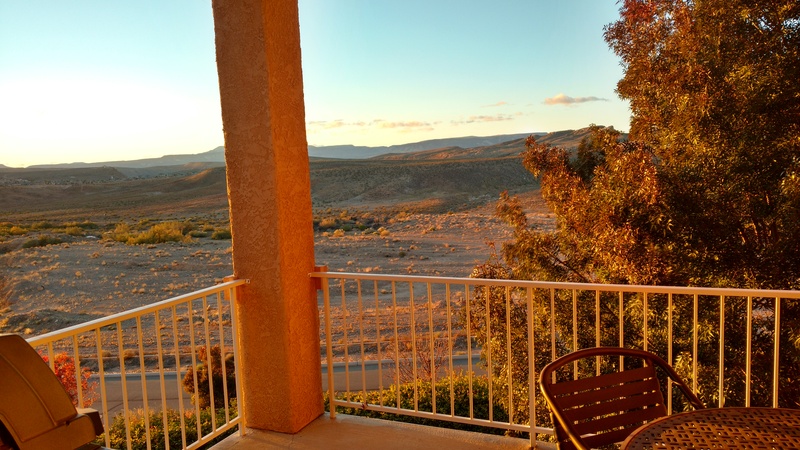 A room on the mountain side of the building gives you great views both day and night — La Vista means “The View,” and that’s what you get at this hotel. 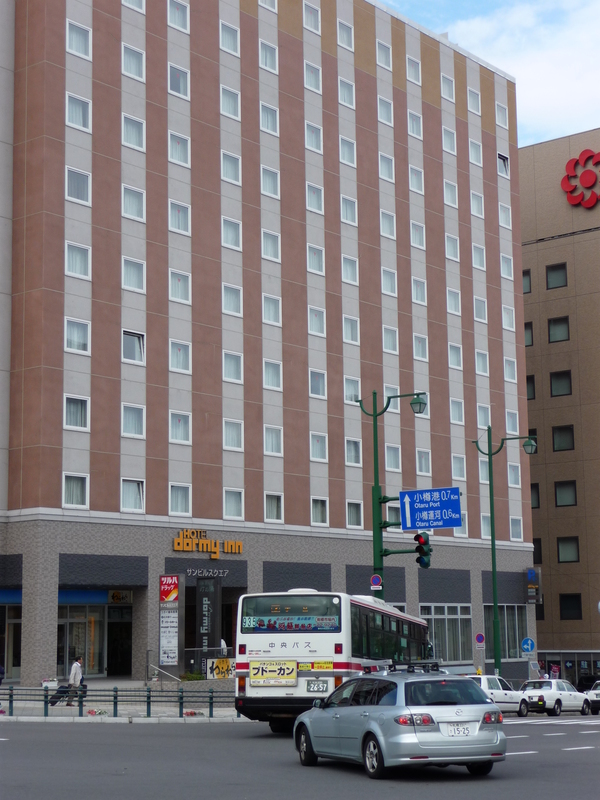 The 10-story Dormy Inn hotel is located just across from the JR Train Station at the corner of Route 5 and Chuodori Street. 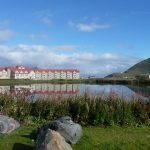 Its prime location makes it an ideal place for travelers wanting to be near transportation or for those wanting to go to the Otaru Canal. 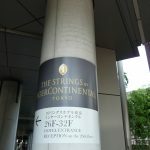 Shopping is also close by as the covered Miyakodori Shopping Street is a 3-minute walk away. Don’t expect USA luxury here, but clean and convenient it is. You have several dining options both on the property and at nearby sister properties, so you won’t go hungry! 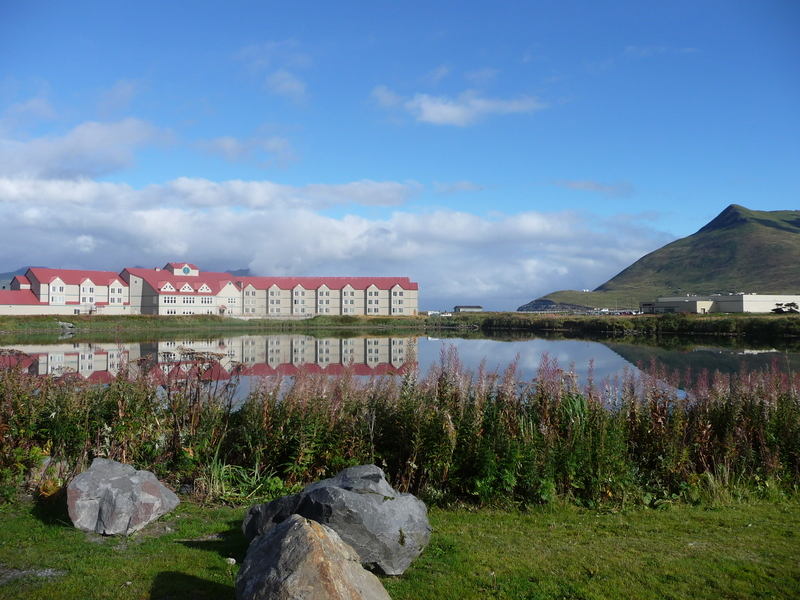 We stayed at this Marriott property for three nights, and we loved it. Our room was on the 27th floor and faced north. 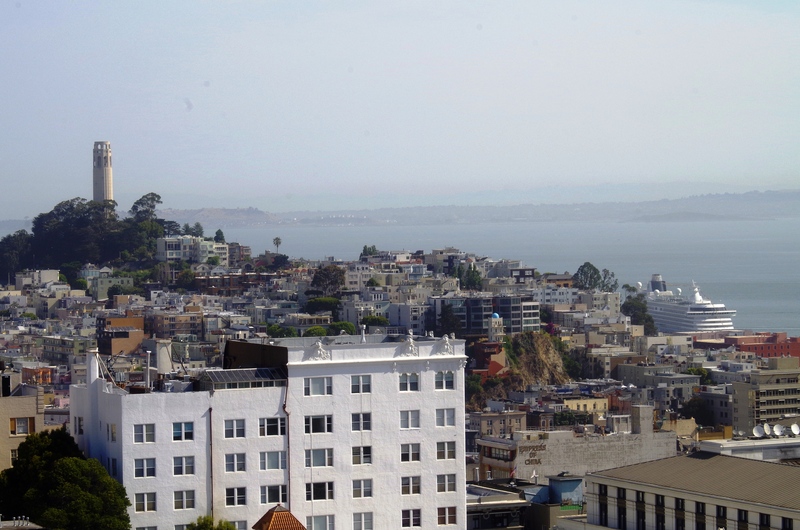 We had a great view of several buildings, including the famous Coit Tower (which was flooded in blue lights at night). 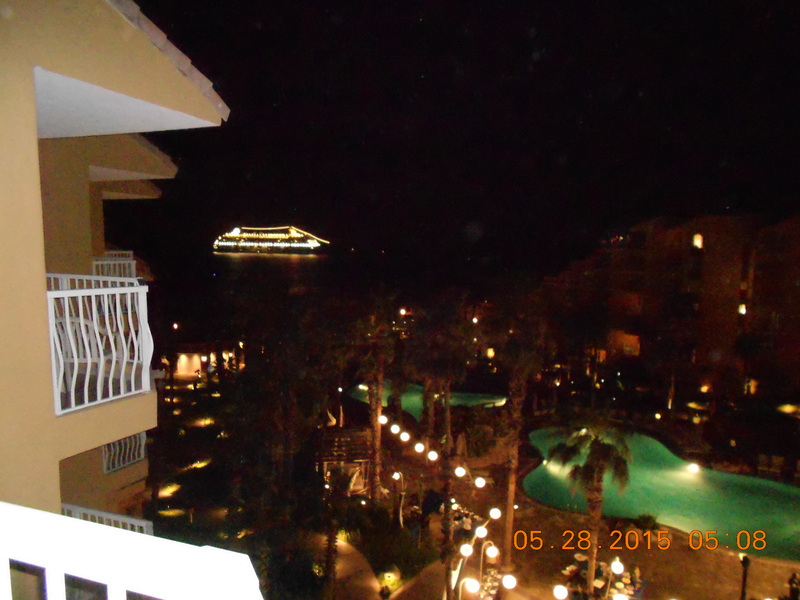 We could even see a cruise ship that was going to be leaving in the afternoon. The staff, bell boys, restaurant personnel, etc., were all very friendly and made us feel as if they were really happy that we were there. You will love the way you’re treated at this hotel. We stayed here at the Fairfield Inn for 2 nights and we were very pleased. It’s located right off Highway 60, but you wouldn’t know it was freeway close when your balcony door is closed. The rooms are spacious and clean with a mini-fridge, microwave and coffee maker. The bathroom is larger than I’ve had in many other higher-priced hotel rooms.The staff has been super friendly, and the complimentary breakfast and wi-fi are nice extras. After I stayed here for 3 days in February, there was no question about where I would take the small-group tour I was leading in April. Barbara set aside some excellent rooms for us (they’re all pretty good, of course), and we had a great time for the 7 nights that we were all there. The complimentary continental breakfast each morning was actually more than most of us could eat — and the fruit was colorful and tasty. Casa Bella is right in the middle of town, but it’s surprisingly quiet. There are many excellent restaurant choices within a 5-minute walk so you can try a different one each night. 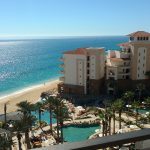 I have already recommended this awesome boutique hotel to many friends, and I would gladly stay here again the next time I take a tour group to Cabo. We rented a one-bedroom condominium here for 4 nights on our road trip. 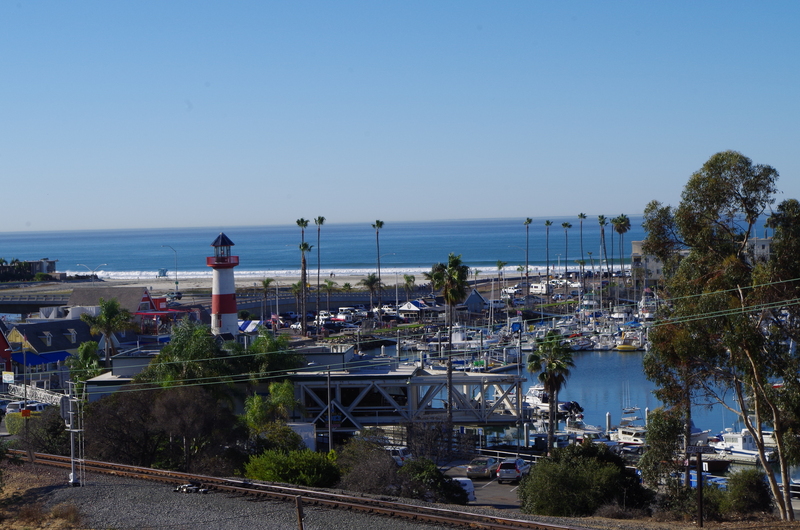 We used to live in Pacific Beach so we knew we wanted to be on the water. It is so great to just sit and look at the ocean and hear the waves. Check-in was so simple with super-efficient Fabbi handling all the details at the next-door bungalow. Parking is secured, and it’s an easy walk to the many restaurants along the walkway or on Mission Boulevard. On a road trip and we needed a room for just one night. We knew there were “better” places to stay, but this Quality Inn was convenient, right next to freeway entrance/exit. Assistant Manager Ana was very helpful and inquired about our stay when we stopped by in the morning — she remembered us! The room was very clean; nice functioning A/C, and overall was rather quiet. Free wi-fi and continental breakfast add to the superb value of this hotel. This is our standard place to stay when we come to Salt Lake City to visit friends. We know that the room will be clean and the staff will be super friendly. We like that it is right off I-15, it has free wi-fi, an indoor pool, and it also has complimentary breakfast. As a Marriott property, this one will be a place you can trust for a nice quality value stay — just as we do each year. Room Tip: A room with 2 queen beds is about 5 feet longer than one with a king bed. I had a cruise scheduled out on Sunday afternoon, and I needed a place to stay on Saturday night. The Hilton was a great choice, and it was so nice to have the hotel shuttle come by and pick me up. The room was clean; the discounted breakfast was nice, and the staff were all very friendly. It’s certainly a good place to keep in mind when you are flying into Miami for a cruise. As WorldMark owners, we’ve stayed at the resort in McCall at least six times. We went up there this week for just a short 3-night stay to celebrate my wife’s birthday as well as just have some relaxing time away from home. 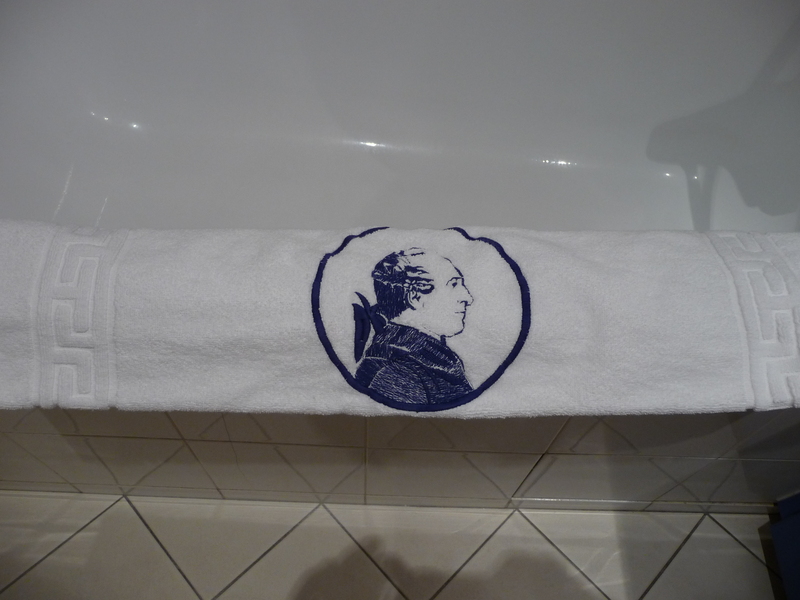 The staff was super friendly (as usual), and the rooms were as immaculate as ever. 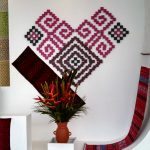 It’s nice to belong to an outfit that really takes care of the surroundings and is reliable for its outstanding service! 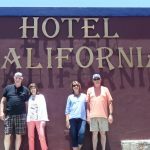 The road was torn up the last time we were there, but that didn’t damped the spirits at Hotel California! We had nachos, a margarita, and enjoyed the outside patio area. This is a fun place to visit, and we’re looking forward to going back there in a couple weeks with 6 friends. Should be fun. Welcome to the Hotel California! 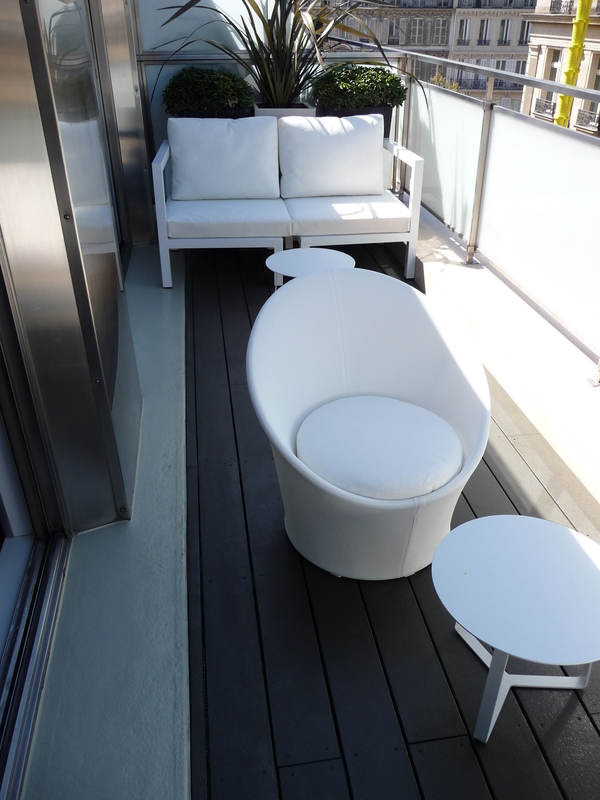 Room Tip: the room is immaterial; it’s the outside bar and patio that make it! We’ve been staying at Playa Grande Resort since we purchased there in 2003. For our two weeks this year (our week plus pulling one forward), we stayed in our own unit (building N) and then our second week was in building A. 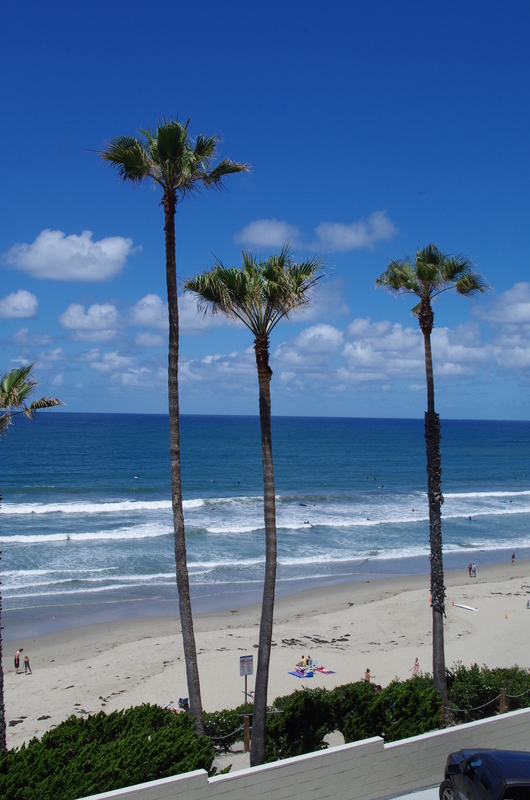 What a delight to be looking straight out at the Pacific Ocean and not seeing (or hearing) the activities at the pools. I wish we could stay in A all the time! Let’s see if we can get in A again in 2017. 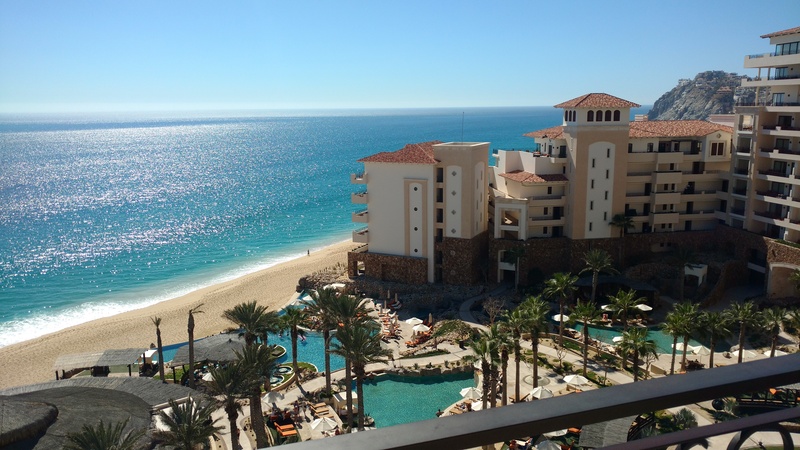 We’ve been going to Cabo each year since 2003, and we typically stay at a timeshare property. This year, after two weeks in a timeshare, we moved into town for 3 delightful days at Barbara’s Casa Bella Hotel. When you walk through the front entrance, it’s just like entering a private villa in Spain or Italy. The rooms are large and well appointed; the varied private spaces on the patios make it seem as if you’re the only guests there. 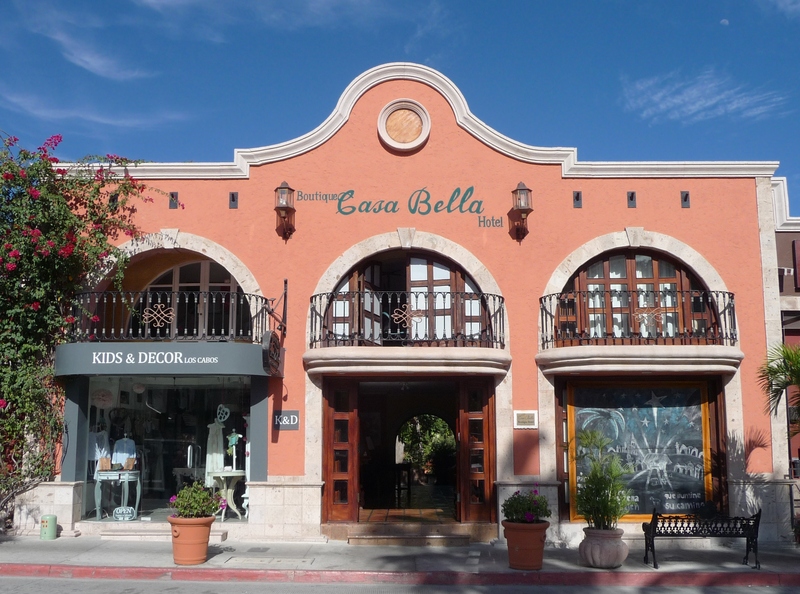 If you want a quiet place amid the hustle and bustle of downtown Cabo, Casa Bella is THE PLACE. Room Tip: They’re all great rooms, but splurge a little extra on one of the mini-suites! The private nature of Terrasol resort — situated between Playa Grande Resort and Solmar Resort — combined with the beautiful Pacific Ocean at the absolute tip of the Baja California peninsula make this the perfect place for quiet and peaceful enjoyment. 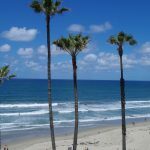 We’ve rented here from the same owner several times plus we stop in to eat breakfast and/or lunch at their palapa restaurant/bar. Mario always has a nice smile and he remembers us from our previous stays. We love this place! We needed one night before we could check into our timeshare. We’d seen this hotel here in town before, so we booked one night and we’re pleased with it. It’s not fancy (no Fairfield Inn is fancy! ), but it’s clean and the people are very friendly. The complimentary breakfast was a nice way to begin our day, and it’s nice to have this rest day before getting into the swing of Cabo! Our tour group stayed at the Grand Terminus, partly because of its convenient location next to the train station. We stayed there for 2 nights and were treated with great service and smiling staff. 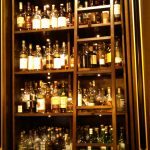 Their whiskey bar is fantastic with a great range of selections and vintages. 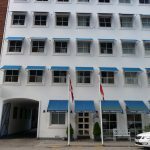 You should check out this historic hotel the next time you’re in Bergen. This hotel is definitely worthy of the name of the magnificent Danish King who was responsible for so much of the beauty that still exists today in Copenhagen. Located on a quiet street, this family-run hotel has 42 nicely appointed rooms and a staff that makes you feel quite at ease. The breakfast buffet is hearty and delicious, and can give you a good start to your ambitious daily schedule. You’re just a one-minute walk to the Rosenborg Castle and Gardens and about ten minutes to Nyhavn. A Metro stop close by makes it convenient getting from and to the airport and the shuttle (bus line 26) to the harbor is one block away if you’re taking the ferry to Oslo. 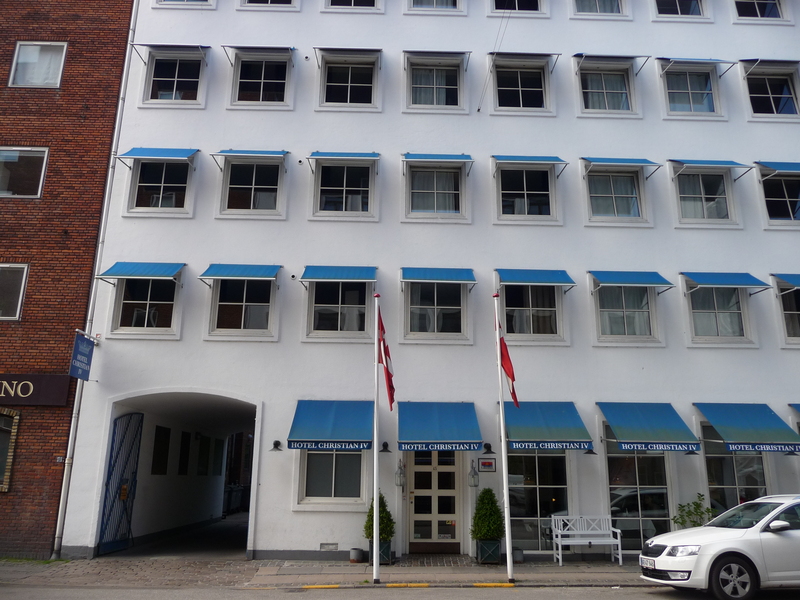 If you’re looking for a great value and a quiet location all within a great walking area, you’ll want to stay here at the Hotel Christian IV. p.s. 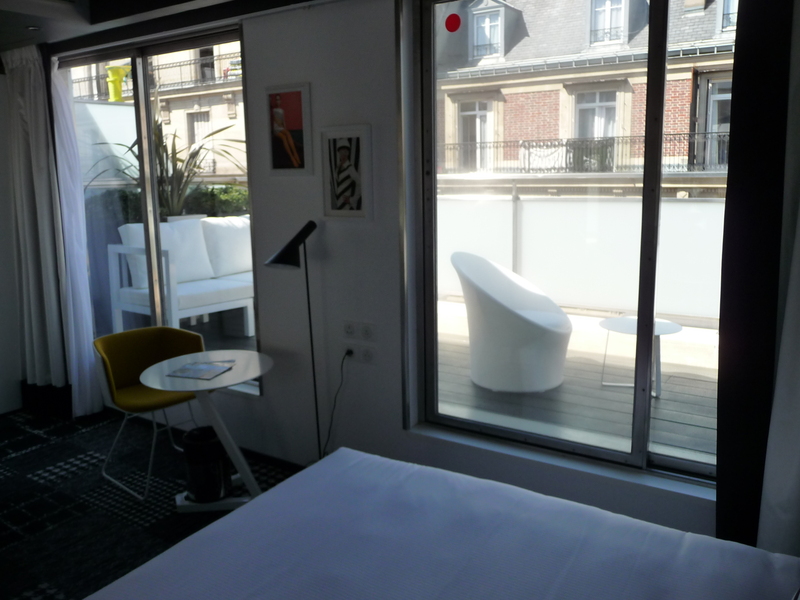 All the rooms are great, even those facing the very quiet street. 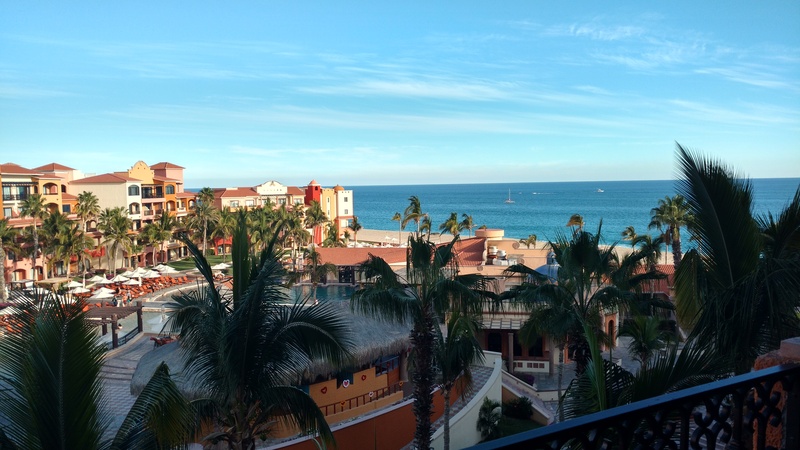 This was our first time to stay at Villa del Palmar in Cabo. We knew the location was great (awesome waves; superb views of Land’s End, and easy access to town), and we were really impressed with the service. Little glitches can happen no matter where you go; how they’re resolved tells a lot about the culture. The “Yes, I can!” badges that all the employees wear are true — they want you to be happy and they’ll do whatever they can to make it so. A special shout out to Misael and to Victor who rose to the occasion to make our stay absolutely fabulous! [SPONSORED] The discreet entrance into this boutique hotel near Le Marais leads you into an 18th Century salon, just as if you were walking into someone’s house. And that is exactly how the owner wants you to feel — as if you’re a guest, not just a paying customer. The classical music you hear could be emanating from the period instruments that are staged, and the wall decorations are pages from the first edition printing of the play “Marriage of Figaro,” penned by the hotel’s namesake. (Mozart wrote the opera of the same name based on this play). 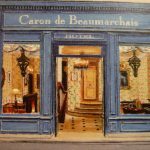 The material on the walls (called “tissue” in France), the carpeting and the drapes are all meant to evoke the romantic era of hundreds of years ago. 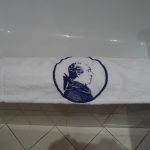 The attention to detail (the lining in the closets; the embroidered silhouettes on the towels; the fresh roses) are to let you know that nothing was left to chance. 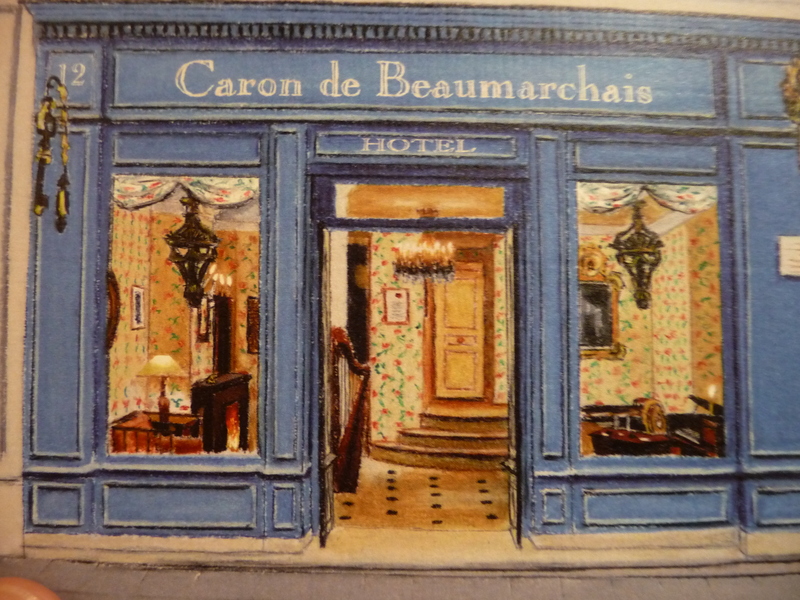 Located just steps off the Rue de Rivioli in the magnificent 4th district, Hotel Caron de Beaumarchais should be your hotel when you want a romantic stay in this lovely city or you want the feeling of elegance from the bygone era. 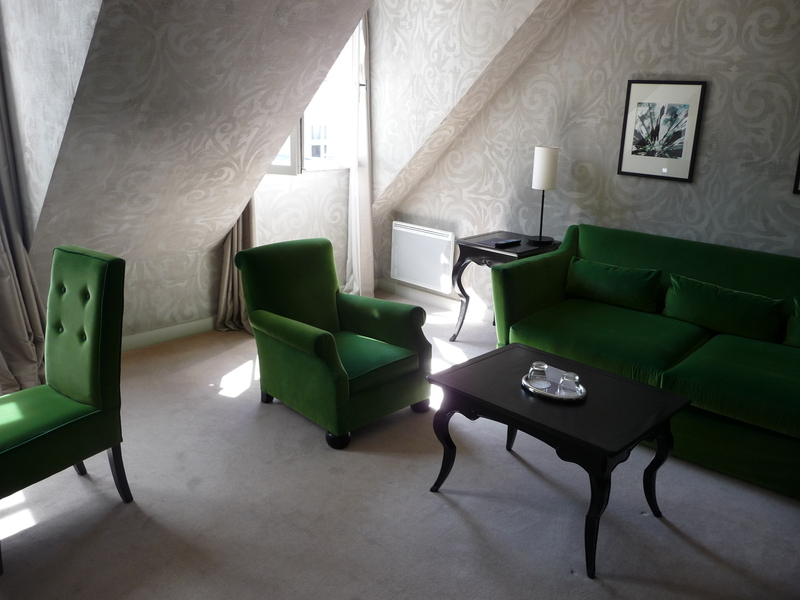 All the rooms are nice; the rooms on level 2 have a small terrace where you can enjoy a cup of coffee or tea, perhaps after you enjoy the delightful complimentary breakfast each morning. [SPONSORED] You don’t find many 3-star hotels that are deserving of more, but this new hotel (opened April 2015) is AWESOME! Designed in the 1970’s style of Andre Courrege, the black and white photos and decorations — with a few spots of color — display clean lines in both form and function. Hotel Ekta is a delightful boutique hotel where you truly feel as if you’re part of the family. You might be greeted by the owner (who also owns neighboring Hotel Galileo) or by Delphine who manages both hotels on Rue Galilee. Visit each floor and look at the photographs that were taken especially for this new and trendy hotel! While staying here, you’re only a two-minute walk from Champs-Elysees and its access to the Arc de Triomphe and everything else that awaits you on that glorious boulevard. Restaurants? You’re in the 8th arrondisement, so all the food is spectacular in this area. 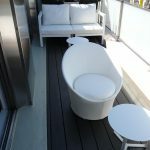 If you’re lucky enough to have a room on the fifth (top) floor; you HAVE to spend time out on your private terrace; it’s a fabulous setting that you won’t want to leave! [SPONSORED] If you want to be near the Champs Elysees and the Arc de Triomphe, yet you don’t want the noise of the main drag of Paris, then Hotel Galileo is a perfect place for you. 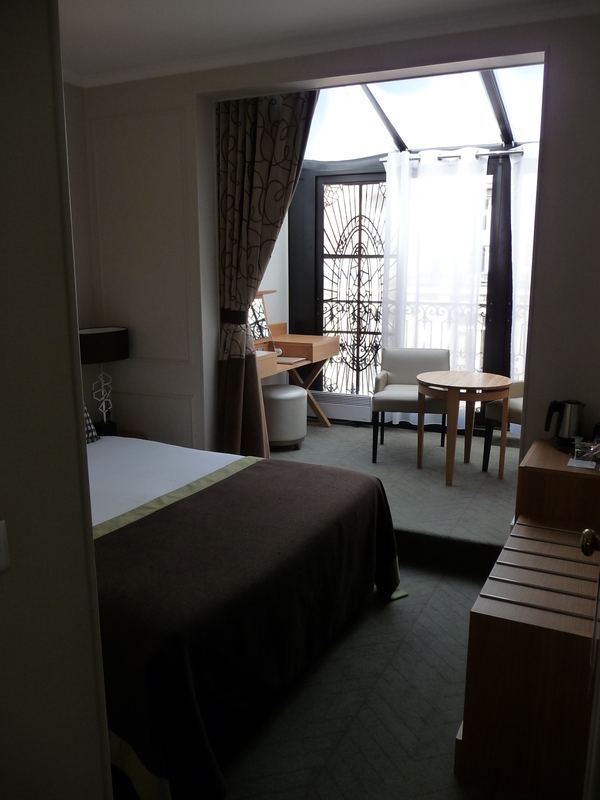 It’s a short 2-minute walk from Champs Elysees along a fairly quiet one-way street. 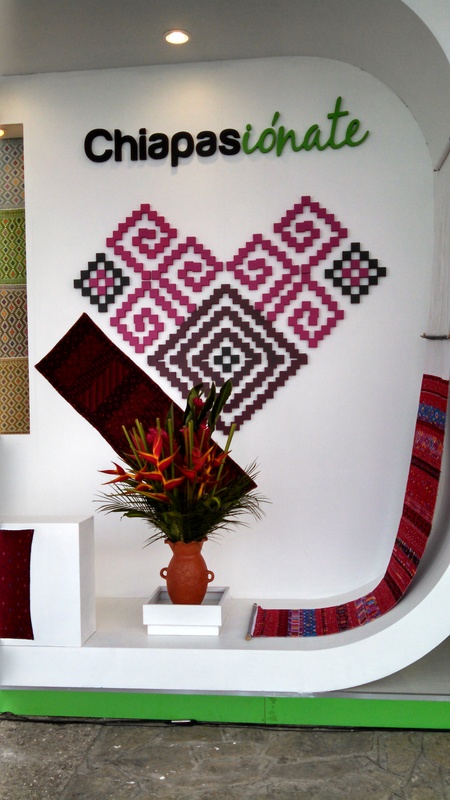 The furnishings are all quite smart and decorative, and the staff is always wearing a smile. If you need directions or assistance, be sure to ask Christopher, the concierge who’s earned the Gold Key for his excellent work, and he’ll certainly help you. 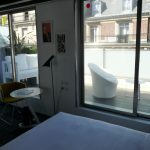 The rooms are well equipped whether you’re in Paris on business or holiday, and the comfortable bed will ensure you get a great rest in the evening! There’s not much to see out your window toward the street, so I’d ask for one that opens to the courtyard area. The exception is if you get a room with a nice covered veranda! [SPONSORED] The Place des Vosges address in the heart of Le Marais is the first indication of the quality of this magnificent hotel. Step through the private entry way onto the terrace and the glass doors entreat you to enter this paradise. The desk attendants are always smiling and that’s because the company owners take excellent care of them — they in turn take excellent care of the guests. There are two salons, with with a library and the other with the “Honesty Bar” where you can pour your own drink and enjoy it inside or outside. The rooms leave nothing to be desired in terms of exquisite furnishings and the ample toiletries. There is a free car park, free use of bicycles, and a spa. 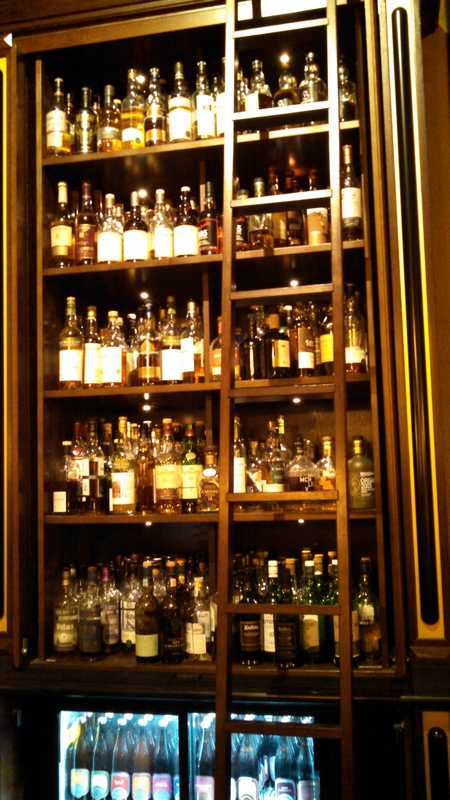 The 4-star rating at this delightful hotel is worthy of Louis XIII himself. All rooms are excellent; those with windows to interior garden are a bit quieter at night. I was here for only one night as I was between lodgings. The high-rise hotel is fairly standard Marriott, but the one thing that stood out was the super-friendly and excellent service. The front desk was very organized, and thanks to mobile check-in, all I had to do was show up and they gave me the room key. The room was quiet and the bed was comfortable! Breakfast was delicious and once again, there was superb service from the hostess desk to the servers. You expect great service at a Marriott property and you won’t be disappointed here! [SPONSORED] Hotel Residence Foch certainly deserves its reputation as one of the finest 3-star hotels in Paris. The warm and cordial greeting by hotel manager Debora tells you instantly that you are going to receive the absolute best treatment possible. The stylish, yet completely functional, rooms allow you to relax in comfort or utilize the free wireless internet connections to stay in touch and make others jealous. There are 25 rooms with no more than 4 per floor. There are several choices for the optional breakfast buffet, including having it delivered to your room. 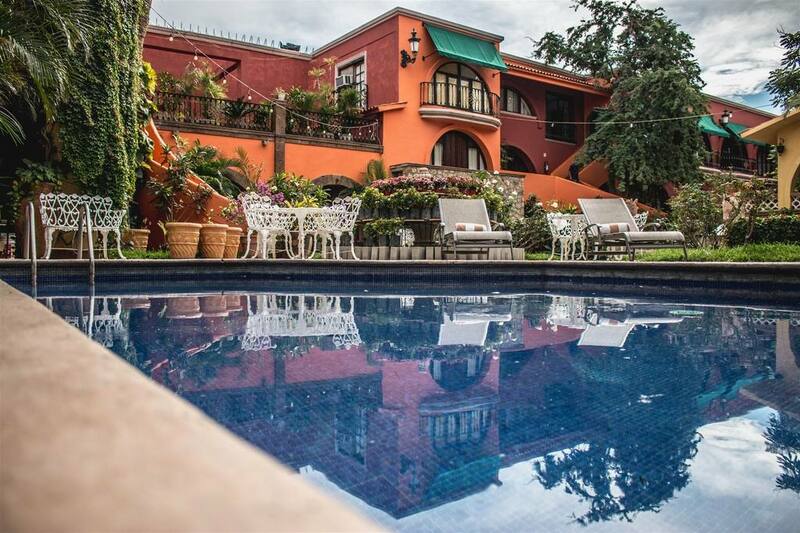 You won’t be disappointed when you stay here at the Residence Foch. A plus is that the hotel is on a quiet street so all the rooms are great. 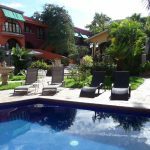 [SPONSORED] I just had four great nights at the Casa del Alma, right in the heart of San Cristobal. 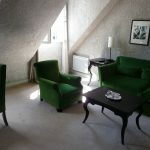 The large rooms are fantastic with soft lighting, free wi-fi throughout, and a small totally private balcony. The dining room staff always had a smile and an eagerness to provide the best service, and the entrees were delicious (especially the chiliquiles). 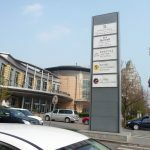 The location is also great, just two blocks from the main square in one direction, and two blocks to a big outdoor market in the opposite direction. While all the rooms are very nice, I’d suggest asking for a room on the second (room numbers starting with 2) or on the third (room numbers starting with 3). I was attending the Chicago Travel Show, and the Hyatt was the “show hotel.” That was really great because we received an outstanding rate ($99/night) plus free buffet breakfast and free internet. Even though my room faced the airport with landing planes, the hotel had provided earplugs, plus my room had one of the HoMedics noise cancellation machines. I slept great all 3 nights. It was also very convenient to the convention center because of the walkway so we never had to go outside (a good thing in the January weather). 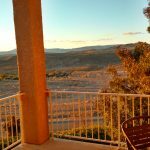 A great stay! We booked two rooms here for 5 days in the City. They’re clean, but SMALL with very little space for clothes and luggage. We’ve stayed at other Fairfield Inns; this one had rooms about 1/2 the size of others we’ve been in. Also, the heater would start and stop all night long even though we’d run the temperature down and turned it to OFF. On the plus side, free internet (wireless and wired) was very good; the morning breakfast was good, and the staff were all very delightful. There are plenty of nearby pubs and restaurants, and subway is also close. I’d probably pick the next-door Spring Hill Suites (also a Marriott property) next time. This is the sixth time we’ve stayed at this Fairfield Inn. We originally chose this location because of its proximity to where we were visiting. We’ve come back each year because we know what we are going to get — great service, a clean room, a fair price, and outstanding personnel. For instance, we were going to be there for 3 days, but I mistakenly only put 2 days on the reservation. When we found this out (on the scheduled departure date), I went to the front desk, where I was greeted with, “That’s not a problem; let’s get you set for one more night and re-do your keys.” It is right off I-15; there are restaurants close by, and it’s an easy short trip into downtown Salt Lake City. I highly recommend this place! This is our eleventh year going to Playa Grande; it is still a great place to stay, and our 4-week trip was made even better by Ana Karen Ramirez at the front desk. She arranged for us to stay in the same room for all 4 weeks. She was fantastic, and she’s already working on our stay for 2014 — muchas gracias, Ana Karen! What we learned is when you’re going for multiple weeks, call ahead and ask for the front desk. Then have a big smile and ask them if you can be booked into the same room for your entire stay so you don’t have to change rooms. Is Barcelona’s La Rambla Worth an Entire Day?